Spring is our family’s season of desperation. You know the season. The one that has more obligations than time. The one where you sleep less, eat out more, and pray that you didn’t forget something. But you did. The one that makes you most anxious, most frustrated, and most happy. And there is a rumor floating around that this season makes you a better person. If you survive. 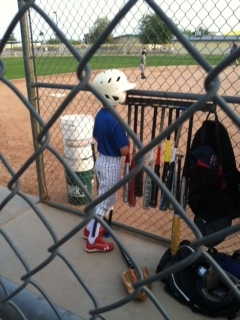 Our family’s spring desperation is brought on by baseball. As in, three sons playing baseball. We need to make room for baseball and all that spring brings. Big room. We need to declutter. Most decluttering tutorials tell us how to rid our lives of stuff, which is definitely a good thing. Declutter: to simplify or get rid of mess, disorder, complications, etc. Exercise emotional agility: to surf the wave of the urge as it comes up, rather than immediately get pushed over by it. This technique helps dieters and smokers resists temptation–and could help clutterers navigate the anxiety they have of letting go. This leads to a bigger conclusion: to not believe every worry, emotion, or want that our brain regions throw into our minds. I can imagine myself surfing the wave of spring anxiety right to the desk of my dreams. 10. Do less. Take your ‘to-do’ list and cross off half the things on it. Just pick a few things to get done today, and focus on those. Let the rest go away. If you do less, you’ll have less on your mind. Ready? Do less. Set? Go slower. Let… Go. To make room for spring, baseball, and peace of mind. ThrEE on bball?? Aye yaya. Bravo, you purged chocolate. I didn’t touch it for…a decade? And then I found a brand that’s completely free of refined sugar. ^^ But I didn’t go crazy. Well written. Upbeat but thoughtful post. He he I knew I would end up tempting you. Let me know if you can’t access the link. LOL! The good news is that I’ve given up chocolate for Lent so I think this Lily’s bar would be a FABULOUS addition to my Easter basket 🙂 I love stevia, yet haven’t had it in chocolate. Yet 🙂 Thank you! Go easy. What any product lacks in sugar it makes up in fat. And vice versa. Just thought I’d toss it out in case you find it useful, Angie. I’m so glad we met via Jason! I’m still learning how to meander this whole blog thing, but generous souls like you two really help me to want to keep at it. YAY! Oh, your blog is just lovely, Angie. Do keep at it. The pleasure you take in writing about your loved ones shines in each post. The Table was actually the seed for a book. A huge vision. I hopped on over to A Holistic Journey temporarily and…the response anchored me there. So between the homeschooling and the Journey (and attempt at sleep, which I will now turn my attention to), I’ve not been able to feed the food blog except during school breaks. Many health food markets carry it, too. Pondering…. What to get rid of and the cluttered desk is VERY convicting:) Great post! It’s good to take stock of things periodically, and get rid of those things that we don’t need anymore, that no longer serve us. Amen, sista! And thanks for the well-wishes. This blogging thing is contributing nicely to my peace of mind, too. How nice 🙂 Happy weekend! Thank you, Aquileana! Yes, the weather and desert flowers are GORGEOUS this time of year. That’s, in part, why the tempo amps up! We’re all moving quickly because we know that serious heat will be here soon 🙂 Happy weekend, friend! It is hard for me to think what it would be like to keep other people – a family – uncluttered and organized in addition to *myself. * If they were messy and wanted to hoard, I don’t know what I’d do. De-cluttering/organizing have become central to my life. I am convinced the outer state of a person’s life reflects the inner. You are soooo right, Colette. Our outer state reflects out inner state. And, even more exciting to me, our outer state can lift up our inner state…make us better, make living better! Coming from a background of, what I call, environmental chaos, it was a thrill to learn that order in my environment helped me to be a better person, helped me to be happier. Nice. The best news of spring for Tom and I is that after 9 frustrating months, he has a correct medical diagnosis and is out of the wheelchair! He sat in the garden while I worked today but said he was getting anxious to start doing a few things. Simply having him up and outside on his own power was indeed a blessing. Awww, Sheri, you used a baseball metaphor to compliment me, you dear friend! ❤ Thank you! Well, we had our wonderful play day and now he’s down again. Off to the doctor tomorrow. Oh the roller-coaster 😦 You’ve got this, Sheri ❤ Praying!